Productivity – Joy M. Pedersen, Ph.D. In Student Affairs, we are constantly juggling multiple projects and deadlines. It can be daunting to keep track of all the items on our to-do lists. Fortunately, there are some great productivity systems to help us. But which products can serve us best? 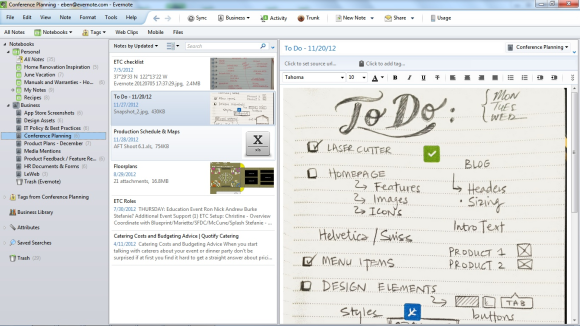 I have used Evernote daily for several months and I love it! Recently our department started exploring Trello for collaborative projects and tasks. I am still learning my way around Trello, but here are some of my initial thoughts on both. Trello is a project management application that makes collaboration easy. It has a remarkably clean and visually appealing interface. Project management. Map out a big project with lists and see all your to-do items on one board. Break larger tasks into smaller tasks. The most common lists seem to be To Do, Doing, and Done, but you can also create lists like Today, Tomorrow, and Someday, or Big Ideas and Little Ideas. Event Planning. Create due dates and visually arrange them on the calendar. If you have annual or reoccurring events, Trello is a great place to archive and record tasks after project completion for easy reference. Collaboration. Add members to a board and communicate about tasks by leaving comments on notes. Notes can be assigned to members, and when a note is updated the assigned member(s) can receive a notification. Multiple to-do lists. You can easily break up your to-do list by day, week, or month, and tasks can be moved from one list to another effortlessly. Supervision. If you are overseeing a project, you can see which team members are contributing to tasks and how the project is progressing. If team members have questions, they can post the questions on notes and you can respond. Evernote is a digital filing cabinet. It is an excellent tool for helping you remember everything (hence, the elephant logo)! Lists. I love to make lists. I have lists of words, quotes, movies, songs, memories…you get the idea. Going paperless. I still like to make notes on paper, but I can take pictures of my handwritten notes and back them up on Evernote. Evernote can decipher the text on pictures which allows me to include pictures of these handwritten notes in my searches. Brain dumping. Evernote is my backup brain. I dump everything into it, which allows me to free up my mental capacity. Once all these thoughts and ideas are out of my head, I easily prioritize and categorize them into notes and notebooks. Storing email. Evernote gives you an email address which allows you to turn your email into a note. Just forward the email you want to save – travel confirmation information, newsletters, or tracking online orders – to your Evernote email address. Sharing notes. You can share a note with another Evernote user or a non-Evernote user using their email address. As I mentioned, I am an avid user of Evernote. I use it throughout the day to keep track of names, blog ideas, birthdays, websites, and meeting notes. However, I am impressed by Trello’s clean interface and collaborative possibilities. What is your experience with Trello and Evernote?